The National Emergency Management Organisation (NEMO) and the Meteorological Office and are closely monitoring weather forecasts indicating that significant wave height is expected over the Eastern Caribbean Wednesday March 19 through Thursday March 20, 2008. A deep low pressure system centered over the North Atlantic is forecasted to generate large northerly swells over the area. This system can generate large sea swells in the region of 4 to 5m (12 to 16ft) or more in the coastal waters around St. Vincent and the Grenadines. A Coastal Flood Watch is in effect until Friday. A Coastal Flood Watch means that conditions are possible for coastal flooding, causing inundation of coastal roads, low-lying areas and beach erosion. The National Emergency Management Organisation is urging all residents and visitors to exercise extreme caution while venturing out to sea, as strong currents and waves will be present. Mariners should exercise extreme caution in securing and operating vessels as these waves can be larger than usual and may create extreme dangerous and hazardous conditions. All residents in low-lying coastal areas are asked to take all necessary measures to protect life and property. Residents in Colonarie, Sandy Bay, Gorse, Georgetown, the Grenadines and those areas that would have experienced significant wave action and storm surge in the past are asked to take the necessary precautions to protect life and property. The local Meteorological Office and NEMO will continue to monitor the situation and advisories will be issued accordingly. Improve your online presence, get a domain name for yourself or your company, only $9.95 per year. hey all, I was looking at our local news and it was stated that we should expect some high seas over the next couple of days. The National Emergency Management Office and the local met office issued a Advisory for persons living close to the coastlines. So far we haven't seen any increase in wave action, i will post here if there are any developments to this matter. Hope all is well with everyone.I will keep in contact. Well Folks..Just had a scary experience here..AN Earthquake,this is the first time i am experience one of this Magnitude..7.3 ! !.Actually i Was on Air at work after making an announcement i noticed my Mic started to sway away from me then the studio began to shake around me..it lasted for some seconds but seemed so long. There no reports so far of any damage..but Mobile Network Cable And wireless seem to have had some interference since their network at my location is down..NO signal and you cant call another provider's network.Hope that is Back soon. Otherwise everyone is OK that i know of..if any developments i will update you. Awoke this morning to a very overcast sky, and the wind has begun to blow a bit around 10 Mph, hope it clears up as this is our Independence weekend. Hello to Haniff…you are so sweet! We have had very hot weather here in SVG yesterday and today, looking at the satellite maps one can see the reason for all this hot sun, 97L is spurning 450 miles out at sea, with 25 MPH winds, we need to be on our guard, these systems have an annoying habit of gathering strength overnight, 450 miles at 16 miles per hour track gives 1.2 days about to be ready, so lets not be complacent and watch 97L carefully. Also wanted to welcome 2 of my favorite people to stormcarib.com, Greg and Liz Thomas. - Ingrid ..Seems to be here..
well folks looks like we have ingrid..the Navy Site as of 9:30 PM says 08 Ingrid with winds of Tropical Storm force..strange enough WunderGround has not updated as yet i wil bet they are waiting for official word on things. TD#8 ( Ingrid) Seems almost stationary Moving now at 5 Miles an Hour ..reaallly Slow, its bent on a WNW -W motion which if continues like this can pose problems for the Extreme Northern Islands..the Leewards..at this time it seems dificult to point any fingers in any direction ..so we just have to wait..maybe a 3 to 5 more days before we know the potential threat. On the Lighter side..It was a sunny warm Day today with only one sprinkle around midday but pretty warm..Nice Breeze . well..Our Prayers are with our friends in Honduras and Belize as hey get prepared for the unpredictable Hurricane Dean a Category 4 ( Cat 5 soon) which is Churning their way..Thanks gert for those stunning Satellite image highlights..Good to look at..but terrible consequences at landfall to any area. 98L Moving WSW ..how strange..although some models don't develop it we need to keep a good eye on at at coming towards the islands around Thursday... after all Felix was not made much from models now Look !! is a now past dean and went from a Depression to a Hurricane in 48 Hours ..a category 4 Besides!! Until my next Update ..Every one stay safe and be Prepared !! Winds remain blustery, and the seas have noticeable waves now, had a gust a while ago about 17Mph, which rattled the windows, the sat images showing something strange happening to Felix, some it seems to be wobbling a bit. The models show it developing further, and keeping a more southerly track than Deane, Folks along it's track take notice, we are in the height of the season. well folks it seems TD 6 is begining to impact the island of st vincent..over the past hour or so the winds have been very gusty..no rain.. looking at satellite imagery i can see a break in shower activity which should end soon with those high top cold clouds moving in with heavy convection..making the situation worst with all the wind now. - TD 6.. Whats Next ? Felix ? Today was a very hot day in Kingstown looking through my window at work it was all quiet with little breeze , After 2 PM the Clouds came Rolling in with one shower then just clouds..about 15 minutes to 4 ( PM) one flash of lightning and all the action began..the rain came down and the fireworks began ( the lightning that is )this continued up until about 7 PM..whats when i left the capital..it was raining Heavily when i did. Arriving to My home in the countryside..i was surprised..there were partly clear skies and just one shower for the afternoon..But it was already getting windy..by 9 PM the Breeze got even stronger..since i can hear the whistling under my roof i assumed it was strong winds.At 10 PM still no rain just the strong breeze from the east. I noticed on latest Satellite imagery that the Convection close to the center is once again coming towards us..Barbados reported 32 MPH winds...and Gusts up to 50 MPH (According to wunderground.com)..I would say the Grenadines and the Southern part of the island is in for some bad weather tonight...Since as of 2 PM a Flood watch was issued for the island. Also at 6 PM Director of National Emergency Management Office ( NEMO) Made an address to the station on all radio stations asking residents to be prepared since we could be in for some bad weather even though the system passes just south ( well..as of 8PM it seems it will be closer than previously expected). He ordered that residents should be on alert in the case of flooding and wind damage and ask that all shelter managers in the southern part of the island open the shelters for residents who may not be secure at their residence. Thats it for now...Hope that was enough info..now back to monitoring TD 6 !! Earlier this evening, we were treated to an amazing light show complements TD6, makes one appreciate the power and fury of nature. The eye of the storm is about 198 miles (319 km) away. If the system keeps moving at its current speed of 16 mph and directly towards you, it will take around 12.4 hours (Saturday, September 1 at 5:24AM AST) to reach you. The winds here picked up at about 4:30 this morning, it is gusting to about 25MPH from the east-north-east, our PM will address at 6 AM, because conditions in the north of the island have deteriorated badly, we may asked to stay safe until the worst of the storm passes. From the satellite pics, the eye will pass between St Lucia and Martinique whose airport reported wind from the NE (040 degrees) at 43 MPH (37 KT) gusting to 64 MPH (56 KT) (direction variable). Stay safe everyone, consider Deane a wake up call for the next one, I see a few more waves off Africa which we need to watch. well it was indeed another beautiful day in st Vincent all quiet with light breeze in the morning.and bright sunshine by late afternoon..late afternoon the sun was out around Kingstown.A light breeze came in around after 4PM only to disappear shortly after. I Left work at 6:15PM ( yes i work that late its radio..anything can happen) the prime minister was making an address to the nation about being prepared for the unexpected and he called on all disaster preparedness machinery to commence operations..while i was waiting for transport to travel to 21 miles from the capital ( yes i live that far from the capital,1 Hour on the roads) around 6:35PM a feeder band went by with gust of approximately 25 MPH and it blew small loose materials(like cardboard boxes) all around where i was. Currenly its breezy on the outside..no strong winds as yet a heavy shower just passed b but its good otherwise.. So i will keep you updated once my X net Internet stays up and i have Power, i have noticed that 2 stations have gone off the air ( not sure why and if its only my frequency) ..Hitz FM and Ezee radio seems to both be off the Air at last check around 9 PM. Until next update everyone keep safe an may god guide us through this..take care everyone! 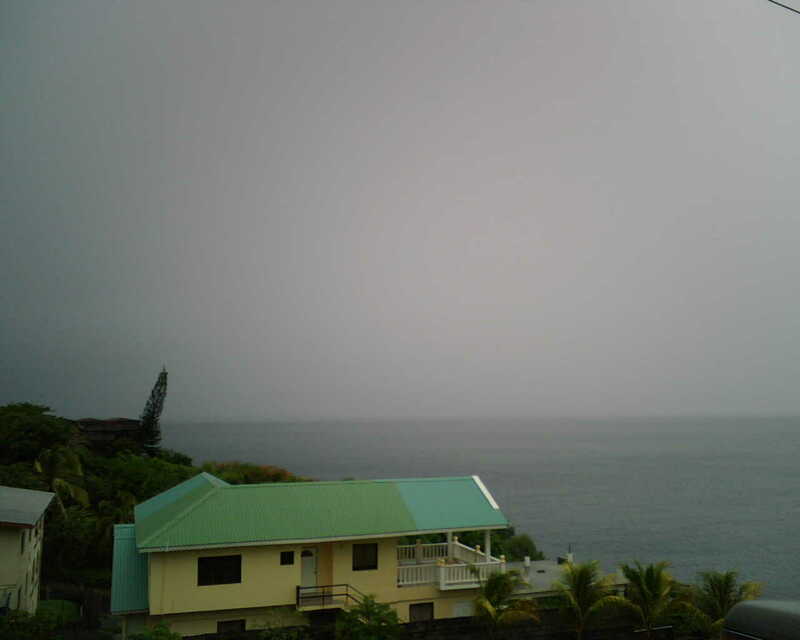 It is so calm outside, no wind is blowing, looking out towards Bequia, i can see lightning flashing in the distance, so some of the Grenadine islands may be experiencing this, I can also see some lights on Bequia, which would mean that visibility is not that bad - waiting to see what happens. Things seemed too normal, a few companies sent home their staff early, and activated their plans, i saw a few hurricane shutters, up and some sand bags outside some business places who are prone to flooding. Already the rain has started, and the wind gusted to about 15 mph, but as soon as it started, it stopped, taking a look at the one realizes how much lives are going to be changed forever after the next few hours, I will continue to update and post as long as power and Xnet stays up. - Dean is drawing closer! Just an update from the island of st Vincent, at 3:30PM the weather is partly cloudy with a light drizzle in the area the wind is calm its absolutely still on the outside and the sunshine is still out as well.. looking at satellite imagery dean is really speeding up its pace towards the islands.. i will beleive it will begin to affect us by later tonight..that is just my opinion..anyway best of luck to all who will be under dean's influence in a few hours and we hope that everything turns out well for all of the islands by god's grace. AS OF 2:00 PM, THE TROPICAL STORM WARNING REMAINS IN EFFECT FOR ST. VINCENT AND THE GRENADINES. THIS MEANS THAT TROPICAL STORM CONDITIONS ARE EXPECTED WITHIN THE NEXT 24 HOURS OR LESS. AT 2:00 PM THE CENTER OF HURRICANE DEAN WAS LOCATED NEAR LATITUDE 13.8 NORTH LONGITUDE 55.5 WEST OR ABOUT 345 MILES EAST OF ST.VINCENT AND THE GRENADINES. MAXIMUM SUSTAINED WINDS ARE NEAR 90 MPH WITH HIGHER GUSTS. STRONGER WINDS...ESPECIALLY IN GUSTS...ARE LIKELY OVER ELEVATED TERRAIN. ADDITIONAL STRENGTHENING IS FORECAST DURING THE NEXT 24 HOURS. THE ESTIMATED MINIMUM CENTRAL PRESSURE IS 970 MB...28.64 INCHES. DEAN IS MOVING TOWARD THE WEST NEAR 23 MPH AND THIS MOTION IS EXPECTED TO CONTINUE TODAY. ON THIS TRACK THE CENTER OF DEAN WILL BE NEAR THE LESSER ANTILLES, INCLUDING ST.VINCENT AND THE GRENADINES EARLY FRIDAY. DEAN IS A CATEGORY ONE HURRICANE. HURRICANE FORCE WINDS EXTEND OUTWARD UP TO 30 MILES FROM THE CENTER. TROPICAL STORM FORCE WINDS EXTEND OUTWARD UP TO 105 MILES FROM THE CENTER. STORM SURGE FLOODING OF 2 TO 4 FEET ABOVE NORMAL TIDE LEVELS...ACCOMPANIED BY LARGE AND DANGEROUS BATTERING WAVES...IS POSSIBLE NEAR THE CENTER OF DEAN. RAINFALL OF 2 TO 5 INCHES...WITH ISOLATED MAXIMUM AMOUNTS OF 7 INCHES IN MOUNTAINOUS AREAS...ARE POSSIBLE IN ASSOCIATION WITH DEAN. THESE RAINS COULD CAUSE LIFE-THREATENING FLASH FLOODS AND MUDSLIDES. SVGMET WILL ISSUE THE NEXT ADVISORY AT 5:30 PM. AN AIR FORCE RESERVE HURRICANE HUNTER AIRCRAFT WILL INVESTIGATE DEAN THIS AFTERNOON. BE ADVISED, ST. VINCENT AND THE GRENADINES IS UNDER A TROPICAL STORM WARNING. On this animation we can see that violent sorms will occur on the southern part of the system. my apologies about the double posting..but i have jsut received this report from the local met office so i apss it on to all who may wish to know whats happening in st vincent. AT 5:00 AM A TROPICAL STORM WATCH WAS ISSUED FOR ST. VINCENT AND THE GRENADINES. THIS MEANS THAT TROPICAL STORM CONDITIONS ARE POSSIBLE WITHIN THE NEXT 36 HOURS. AT 500 AM HE CENTER OF HURRICANE DEAN WAS LOCATED NEAR LATITUDE 13.4 NORTH...LONGITUDE 52.3 WEST OR ABOUT 545 MILES EAST OF ST.VINCENT AND THE GRENADINES. DEAN IS MOVING TOWARD THE WEST NEAR 24 MPH. THIS MOTION SHOULD BRING THE CENTER OF DEAN NEAR THE LESSER ANTILLES ON FRIDAY. HURRICANE FORCE WINDS EXTEND OUTWARD UP TO 25 MILES FROM THE CENTER...AND TROPICAL STORM FORCE WINDS EXTEND OUTWARD UP TO 70 MILES. MAXIMUM SUSTAINED WINDS ARE NEAR 75 MPH WITH HIGHER GUSTS. DEAN IS A CATEGORY ONE HURRICANE. STORM TOTAL RAINFALLS OF 2 TO 5 INCHES...WITH POSSIBLE MAXIMUM AMOUNTS OF 7 INCHES IN MOUNTAINOUS AREAS...ARE POSSIBLE IN ASSOCIATION WITH DEAN. THESE RAINS COULD CAUSE LIFE-THREATENING FLASH FLOODS AND MUDSLIDES. AN INTERMEDIATE ADVISORY WILL BE ISSUED AT 8:30 AM FOLLOWED BY A COMPLETE ADVISORY AT 11:00 AM. ISLANDS OF DOMINICA AND ST. LUCIA BY THEIR RESPECTIVE GOVERNMENTS. you when necessary.until then everyone start preparing in the above mentioned islands! Except that, the sunset tonight was absolutely gorgeous!! I have just integrated the hurricane correspondents... This is my first post from St Vincent and the Grenadines. In St Vincent, we have one of the brighter and warmer afternoon for a long time, and nobody talks about the upcoming Dean. - TD #4 is Here! so start to prepare ! hello all...My First post on stormcarib..
significant feature being - major storm or hurricane out of this. until next time..i am out.. Within the last 2 hours we have been bombarded with about 22Mph gusts and driving rain, the lightning and thunder is adding to the spectacle tonight, from the latest sat pics, we will be in for a blustery night.